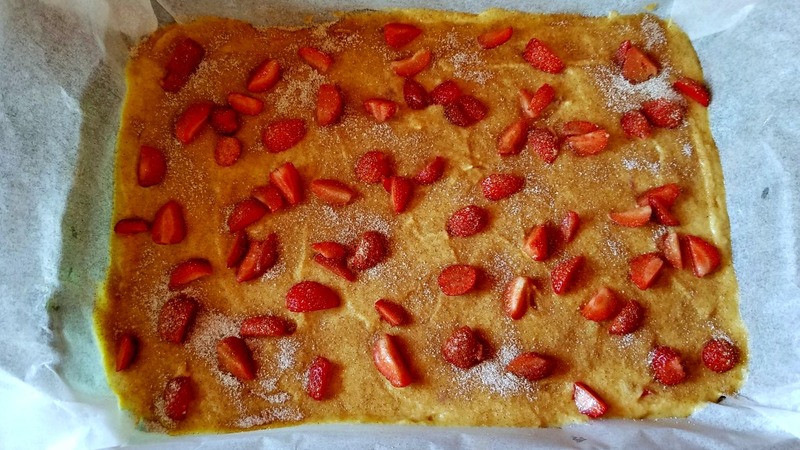 As I mentioned last week when I posted the recipe for Lemon Strawberry Tart, we had a great strawberry harvest. When we moved on to our little piece of paradise our goal was to grow most of our own food. I freeze strawberries so that we have them all year ’round to enjoy. Now I hope that when the blackberries come in that harvest will be just as bountiful. Grease a 13×9″ pan, line with parchment and then grease the parchment paper and flour the pan. 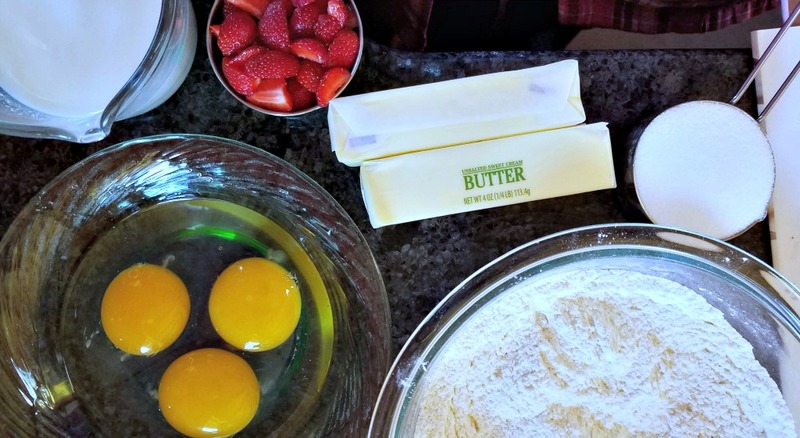 Mix the 1/2 cup strawberries with 1/2 tsp flour and set aside in a small bowl. Whisk together the remaining flour, salt and baking powder. In a stand mixer with the paddle attached cream the butter and sugars until light and fluffy. Pour batter into the prepared pan and spread evenly. Bake in the preheated oven for 45 – 50 minutes until a toothpick comes out cleanly. Rotate the pan halfway through baking. Cool cake in pan for 20 minutes and then remove and cool completely before cutting. Dust with powdered sugar if desired. 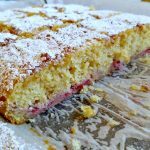 How Was the Strawberry Coffee Cake? This is a really lovely coffee cake. It’s light and not too sweet. The strawberries surprise with a bit of sweet/tart flavor. To me it almost tastes like it was made with a bit of cornmeal but as you can read in the ingredient list there is none used. While it’s called a coffee cake it is a delightful treat at any time of day. I adapted this recipe from one in The Perfect Cake by America’s Test Kitchen. 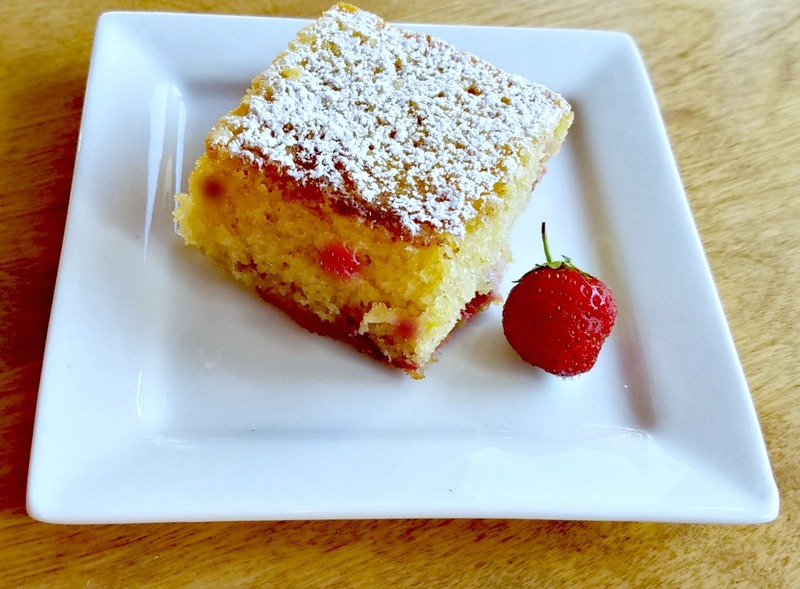 A delicious, not too sweet cake that is perfect with coffee, tea or a glass of ice cold milk.